Is God Trying To Talk To Somebody In America? Are Christians Being Groomed to Accept The Coming Antichrist? It would be pleasant to think that using the Bible during the US Presidential Oath of Office actually means something to those who place their hand on it and swear to "faithfully execute the Office of President of the United States… so help me God." But Obama, who had to repeat his swearing in ceremony after the word "faithfully" was garbled by Chief Justice John Roberts during the inauguration, did so the following day in the Map Room of the White House before a press pool and a small group of aides, and this time, the Oath was administered without the use of a Bible, insinuating to some that the Good Book was only public "eye-candy" in the first instance and also that the Oath of Barack Hussein Obama was biblically invalid. While this may seem trivial to the average person, what it means to secret orders is consequential. Groups such as Masons (who honored Obama with the first-ever-inaugural ball in Washington, DC, January 20th, 2009) esteem rituals, gestures, the use of books such as the Bible, and Oaths taken by heads of State to be of the highest mystical importance. This is why everything they do is administered through appropriate rituals, initiations and incitations. Ethereal power—including supernatural agents—can be manipulated, bound and released to execute blessings or curses as a result of proper oaths. Breaking an oath can likewise result in dire repercussion in their opinion. Because this is not taken lightly by occultists, members of the Craft would have a difficult time believing the Oath of Office of the President of the US—one of the most hallowed American traditions—was so easily flubbed. The very beginning of the Oath, "I do solemnly swear," is a spiritual petition. The word ‘solemn’ means ‘an invocation of a religious sanction’ or entreaty before deity to witness, sanction and bless the binding nature of the ceremony to carry out the office or duty. The oath also binds the individual before "God" to faithfully execute the covenant. Thus government representatives make an oath before taking public office, and witnesses in a court of law take an oath to "swear to tell the truth" before offering testimony. These principles are deeply rooted in the Judeo-Christian faith as well as most other religions. Though there is no way of knowing what the Presidential Oath of Office deeply means to Obama or whether the blunder and redo of the swearing in ceremony was anything more than an accident, the unprecedented gaffe was suspicious to some as possibly representing important hidden meaning. Misgivings over it were additionally compounded when reflected against other curious activities and declarations by Barack Obama, which most of the media missed, downplayed, or simply refused to report on, that strongly connected his emergence with occult mythology identified in the Bible as both prophetic and demonic. An extraordinary example of this was when Obama gave his speech in Berlin, Germany, on July 24th, 2008, titled "The World that Stands as One." More than a few students of occult history took notice of the symbolism and location of the event, even causing some who until then had rejected any "antichrist" labels hurled at Obama to reconsider their position. This included respected Catholic writer Michael O’Brien, best known for his apocalyptic novel Father Elijah. O’Brien had received numerous letters and emails from subscribers and visitors to his website wondering if Obama was the Antichrist. At first O’Brien wrote that this was not possible. Then a friend that had seen Obama’s speech in Berlin called him, talking about how mesmerizing the speech was and that an announcer over German radio had said: "We have just heard the next President of the United States… and the future President of the World." By now Obama was conveying an unusual likeness to the Antichrist character of his novel. After watching the Berlin speech several times for himself, O’Brien sent out a newsletter in which he admitted that, while he still doubted Obama was the prophesied ruler of the end times, he had come to believe he was "a carrier of a deadly moral virus, indeed a kind of anti-apostle spreading concepts and agendas that are not only anti-Christ but anti-human as well." O’Brien finally conceded Obama could be instrumental in ushering in the dreaded Great Tribulation period, and worse, that he was "of the spirit of Antichrist." After Obama’s term of office was underway, O’Brien pointed out the numerous foreign and domestic problems Obama was facing, including wars in Afghanistan and Iraq, the possibility of a new war with Iran, and issues related to the crumbling financial systems, saying these obstacles could overshadow Obama and lead to his defeat in the next presidential election. O’Brien then added in what was a clear reference to the coming of Antichrist, "Alternatively, he could become the ‘Great Facilitator,’ negotiator, peacemaker, working marvels throughout the world as he moves from one seemingly unsolvable problem to another." Because it is true that any significant public political event requires both forethought and symbolic meaning, the location where Obama gave his Berlin speech in front of Berlin’s Victory Column contributed to O’Brien’s conclusions. The site was offensive to educated Germans as well as to Christians and Jews because of its ties to Adolf Hitler and the Nazis. It was nevertheless oddly appropriate, for it was upon this exact location that Hitler had planned to enthrone himself in the Welthauptstadt Germania—the new "World Capital" upon winning World War II. During the 1930s, Hitler commissioned Albert Speer "the first architect of the Third Reich" to design the new capital. As part of the plans, the "Siegessäule" or Berlin Victory Column—a 226-foot monument topped by a golden winged figure representing Borussia, the female personification of Prussia, and Victoria, the cult goddess of military victory—was removed from its location in front of the Reichstag building in 1939 and relocated to its current location in the Tiergarten, a 495 acre park in the middle of Berlin where Obama gave his speech in front of the Nazi symbol. Rainer Brüderle, deputy leader of the liberal political party Free Democrats in Germany complained to the newspaper Bild am Sonntag: "The Siegessäule in Berlin was moved to where it is now by Adolf Hitler. He saw it as a symbol of German superiority and of the victorious wars against Denmark, Austria and France." This represented a serious question In Brüderle’s mind as to "whether Barack Obama was advised correctly in his choice of the Siegessäule as the site to hold a speech on his vision for a more cooperative world." Another German politician named Andreas Schockenhoff was equally disturbed, saying, "It is a problematic symbol." Evidently it was not problematic for Obama, who stood in front of it and saluted the German audience in a way eerily similar to what Adolf Hitler used to do, followed by thousands returning the salute, which is against German law. When Obama ended his speech in front of the war goddess, he said, "With an eye toward the future, with resolve in our hearts, let us remember this history, and answer our destiny, and remake the world once again." This is exactly what Hitler had promised to do and exactly where he had planned to memorialize it. Of greater significance and not far from where Obama delivered his rousing speech, is the Great Altar of Zeus in the Pergamon Museum. 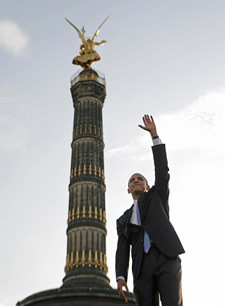 According to several reports, Obama visited the Great Altar while in Berlin, which is especially important given what he did on returning to the United States. Before we examine Obama’s revealing actions, consider carefully what the Bible says about the Altar of Zeus in the letter to the church in Pergamos (Pergamum, Pergamon). "And to the angel of the church in Pergamos write; These things saith he which hath the sharp sword with two edges; I know thy works, and where thou dwellest, even where Satan’s seat is: and thou holdest fast my name, and has not denied my faith, even in those days wherein Antipas was my faithful martyr, who was slain among you, where Satan dwelleth" (Rev. 2:12-13). In the Greek, the phrase "where Satan’s seat is" literally means, "where a throne to Satan is." Scholars identify this throne or ‘seat’ as the Great Altar of Zeus that existed in Pergamos at that time. So important was the worship of Zeus in ancient Pergamos that perpetual sacrifices were offered to him upon the towering and famous 40-foot high altar. Antipas, the first leader and martyr of the early Christian church is believed to have been slain on this altar, slowly roasting to death inside the statue of a bull, the symbol and companion of Zeus. The phrase in Revelation 2:13 "wherein Antipas was my faithful martyr, who was slain among you, where Satan dwelleth" is considered a citation of this event. Approximately two-thousand years after Revelation 2:13 was written, German archeologists removed the massive altar of Zeus from the ruins of Pergamos and took it to Berlin, where it was restored as the centerpiece of the Pergamon Museum. It is here that Hitler first adored it, later building an outdoor replica of it from which he gave a series of speeches that mesmerized many Germans. "Fast forward about another 75 years," says blogger El Gallo. "Another charismatic young politician mesmerizes huge German crowds with a rousing speech in Berlin. Barack Hussein Obama…. [and] did Barack Obama visit… the Great Altar of Zeus…? Presumably he did." Whether Obama received inspiration from the throne of Satan while in Berlin or not, what he did next was astonishing. Upon returning to the United States, he immediately commissioned the construction of a Greek-columned stage from which he made his acceptance speech for his party’s nomination. Because Greek temples such as those built to honor Zeus were thought to house the patron deity, the GOP ridiculed Obama, mocking him as playing Zeus of "Mount Olympus" and accusing his supporters of "kneeling" before the "Temple of Obama." The New York Post ran an enlightening Convention Special supplement on August 28th, 2008 with the telling headline: ‘O’ MY GOD: DEMS ERECT OBAMA TEMPLE blazoned across the front cover. 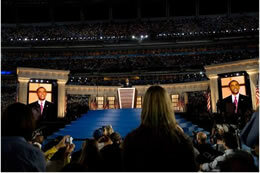 But it was not until blogger Joel Richardson pointed out how the design of Obama’s stage was a dead ringer for the Great Altar of Zeus  that Obama’s campaign managers tried to explain away the design as being a conglomeration representing the portico of the White House with the U.S. capital building. "But experts agreed with Richardson," Gallo wrote, "it was a replica of the Great Altar of Pergamum." Thus, incredibly, like Hitler, Obama had honored the goddess Victoria with his presence before ordering a replica of the biblical throne of Satan built, upon which he accepted his date with destiny. A final troubling disclosure at the conclusion of this entry may cast light on why Obama seemed fascinated with such anti-Christian symbolism in the lead-up to his election victory. A Hadith (tradition) sacred to Shiite Islam from the 17th century contains a prophecy from Ali ibn Abi-Talib, which predicts that just before the return of the Mahdi (the end-times redeemer of Islam), a "tall black man will assume the reins of government in the West." This leader will command "the strongest army on earth" and will bear "a clear sign" from the third imam, Hussein. The prophecy concludes that: "Shiites should have no doubt that he is with us." Does this Islamic prophecy identify Obama as the "promised warrior" who comes to help the savior of Shiite Muslims conquer the world? Amir Taheri asked this very question for Forbes Magazine in October, 2008, pointing out how "Obama’s first and second names—Barack Hussein—mean ‘the blessing of Hussein’ in Arabic and Persian" while his "family name, Obama, written in the Persian alphabet, reads O Ba Ma, which means ‘he is with us,’ the magic formula in Majlisi’s tradition." Leap forward to 2009, and Barack Hussein Obama on June 4 gave an unprecedented speech to the Muslim world from Cairo, Egypt declaring that he is launching a new era between the United States and the Muslim world. For the first time, Obama was forthright about his Muslim heritage and stated that the United States—which he is on record as saying is "no longer a Christian nation"—is now "one of the largest Muslim countries in the world." Newsweek editor Evan Thomas followed the president’s speech with a declaration reflected in the opinion of many, that "Obama is standing above the country, above the world, he is a sort of God." These principles are deeply rooted in the Judeo-Christian faith as well as most other religions. Though there is no way of knowing what the Presidential Oath of Office deeply means to Obama or whether the blunder and redo of the swearing in ceremony was anything more than an accident, the unprecedented gaffe was suspicious to some as possibly representing important hidden meaning.